Akron is expanding the reach of its drug court to include those charged with drug-related offenses in Stow Municipal Court. 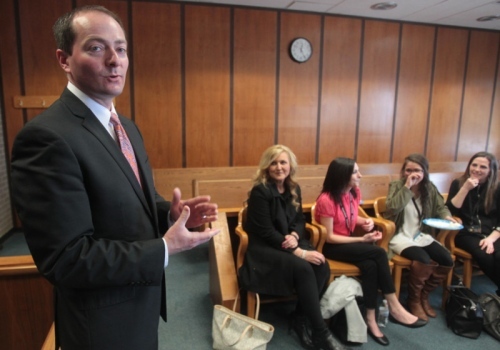 Under a partnership that began Monday, defendants in Stow court will be given the opportunity to complete Recovery Court, the drug court program in Akron. Those who successfully complete the program, which requires one year of sobriety, have the charges against them dropped. Unlike Akron, Stow doesn’t have a drug court. Oldham and others involved with Recovery Court announced the new endeavor during an event held Friday in Oldham’s court. Judge Joy Malek Oldfield, who handled Recovery Court until she moved to Summit County Common Pleas Court, got the idea for the partnership in 2015 when she learned that Cleveland Municipal Court had opened its drug court to suburban communities. She had a meeting with the judges in Stow and Barberton to see if they were interested in following Cleveland’s lead. The Stow judges agreed, but Barberton Judge Jill Flagg Lanzinger started her own drug court instead. Lanzinger recently was appointed by Gov. John Kasich to fill a Summit County Common Pleas Court vacancy, and it is unclear what will happen with Barberton’s drug court when she assumes her new post April 3. Stow Judge Kim Hoover thought collaboration was the best approach. Hoover said he sees this as a type of regionalism that cuts down on duplication and saves money. Defendants from Stow who are deemed by judges Hoover or Lisa Coates to be eligible for Recovery Court will be given the option of entering the diversion program. They then will go to Akron for a medical assessment. The Stow court will maintain jurisdiction of their cases so that if they are terminated from the program, they will return to Stow for the disposition of their cases. If they complete the program, Akron will notify the Stow court and the charges against them will be dismissed and their cases sealed, Oldham said. Akron currently has 44 people in its drug court. About five Stow defendants a month are expected to be referred to the Akron program for charges such as possession of criminal tools and theft tied to heroin addiction. Recovery Court, started in 1995 by Judge Elinore Marsh Stormer, now the Summit County Probate Court judge, has had 1,000 graduates since its inception. Oldham took over the program Dec. 1 for Oldfield, who was elected to the Common Pleas Court bench in November. Oldfield is presiding over Turning Point, the felony drug court. Oldfield is pleased that Oldham followed through with the collaboration she started.